Share "Fall Garden Clean Up is Spring Preparation"
Every good gardener knows that there is a season for everything. The best gardeners know how to make each season count. What if I told you that cleaning up your garden will help prepare you for spring in more ways than you ever imagined? Fall garden cleanup is important; next spring when the new plants begin to grow, they can come bursting forth without the disruption of weeds, diseases, and bugs. Check out the following tips on how to maximize your spring garden potential by cleaning up your fall garden. The first thing you should do is check your gardens for any changes and harvest your seeds. It allows you to assess how your plants thrived and how they did not. It allows you to open your mind for how to make improvements so that each season is better than the one before. You may not think that you need to make changes to your garden plan, but there is always room for improvement. Afterwards, harvest your seeds for those plants that you want to keep. Seed saving is a great way to jumpstart your spring garden as well as exchange possibilities with friends. Many gardeners like to exchange and share seeds. It's one of the few ways we are able to afford all the plants in our yard. Next, you should remove dead or diseased foliage. If you suspect a plant is diseased, clean up the area where the diseased plant grew very well. This is important because it can affect the next seasons’ garden if there are still remnants of the disease left behind in the garden bed. Remember to check your garden for blights, any kinds of leaf mold, and insects that may destroy your plants. These also need to be cleaned up exceptionally well. If there is any diseased foliage, do not compost it! Putting diseased foliage in compost will enable the disease to spread throughout the compost. If you use this compost at a later date, you will kill the plants in your garden. Only put the foliage that is dry and dead in the compost bin, and burn all foliage that is diseased. Finally after you have fully cleaned your garden, you have to enrich the soil and mulch. Before winter comes, enrich your soil with manure or compost. This is a great and simple way to add nutrients to your soil so that you are prepared for spring. In addition to enriching the soil, for those gardens that exist in cold zones you should add some form of mulch. During the winter, the mulch will compost and help add more nutrients to the garden during the early spring months. 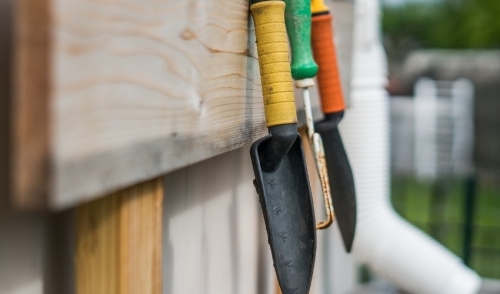 Be sure to take the time to perform maintenance on any of your gardening equipment. Fall and winter are perfect times to fix what you need in time for next spring. Maintaining a clean garden throughout the winter is best step you can take towards a rewarding spring.